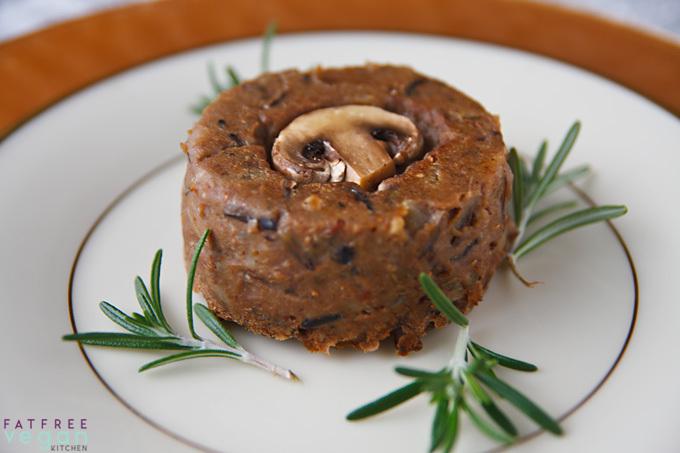 With a texture like mushroom pate and all the savory flavors of Thanksgiving, these mushroom timbales will be the perfect vegan main dish on your holiday table. My Thanksgiving menu planning will always be an exercise in fantasy because we celebrate the holiday at my in-laws’, but if I were serving Thanksgiving dinner at my house this year, my menu would include Green Bean Casserole, mashed potatoes and mushroom gravy, cornbread dressing, Cranberry Relish, Sweet Potato Casserole, Double-Layer Pumpkin Cheesecake, and these Mushroom, Lentil, and Wild Rice Timbales. Since I don’t get to cook much for the actual holiday (and only those items that will travel well) I spend the weeks before the big day doing Fantasy Holiday Meals—not the whole meal, mind you (you know how lazy I am), but a dessert here, a side dish there, as part of a regular meal. 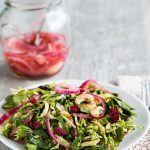 It keeps me in practice for holiday cooking and, let’s face it, gives me something relevant to post here for anyone looking for holiday meal ideas. So last night I attempted my fantasy main course. I wanted something savory and elegant, something special enough to be the focal point of a meal but still light enough to allow room for all the other dishes. These timbales, if I say so myself, achieved all of those goals and more. They’re ridiculously delicious, if not ridiculously easy. 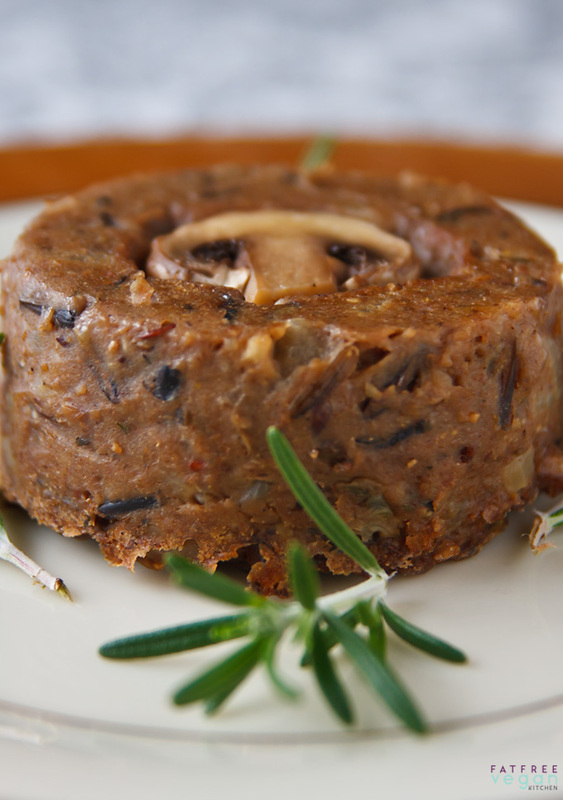 The texture is like mushroom pate, with wild rice providing just a touch of chewiness. 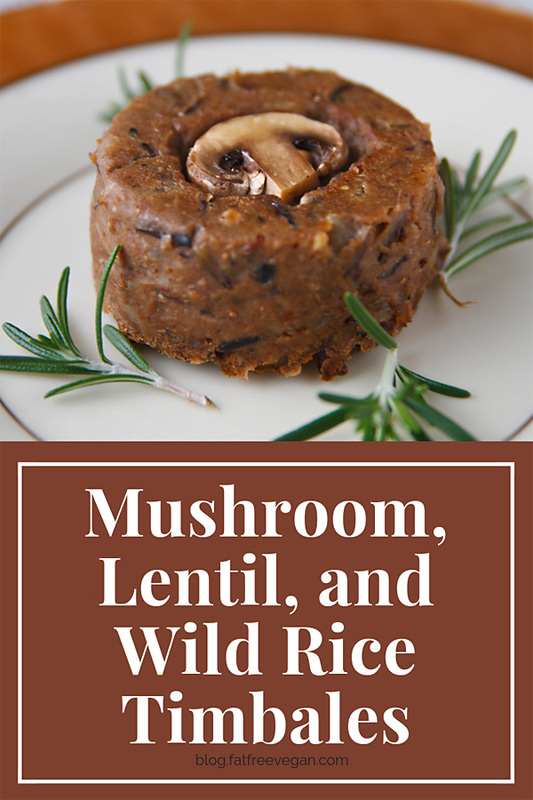 All the savory flavors that I associate with Thanksgiving are here: the earthiness of mushrooms and lentils, the warm herbal flavors of sage and thyme, a hint of pungency from the rosemary. 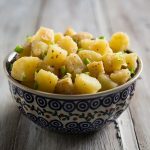 The idea for this recipe came from Crescent Dragonwagon’s Passionate Vegetarian, though I changed her recipe so much that she might not want to claim it. First I veganized it (the original contained eggs), and then I completely changed the seasonings. Finally, I tried to simplify it a little, but let’s face it, unless you happen to have cooked lentils and wild rice on-hand (who does? ), this recipe will probably take you a couple of hours and leave your kitchen in as bad a shape as it did mine. But let me tell you, it’s worth it! These timbales also make a delicious appetizer spread on crackers. Make ahead: 1 cup cooked lentils (from about 1/2 cup dried) and 1 cup wild rice (about 1/2 cup before cooking). Bake, uncovered, until tops are brown and crusty and middles seem moderately firm when pressed with a finger–about 45-50 minutes. Remove from the oven and allow to cool for 10 minutes. Run a thin knife around the edges and invert the ramekins onto serving plates. Serve with your favorite mushroom gravy (or see mine below). This is my standard mushroom gravy. 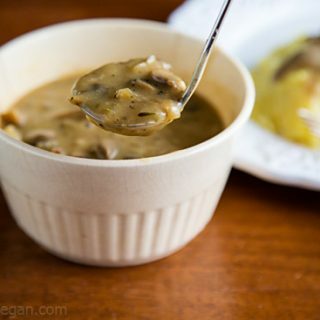 If you’re not a mushroom lover or need a gluten-free gravy, be sure to try my 911 Vegan Gravy. My mushroom gravy is always an ad lib affair; I don’t think I ever make it the same way twice. Here’s the basic recipe, but the amounts of herbs should be adjusted as necessary. This time I kept them light so that they didn’t compete with the timbales’ seasoning. In a medium-sized non-stick saucepan, saute the onion until light brown, about 10 minutes. Add the mushrooms and 1 tablespoon of water, and cook for another 3 minutes. Add the garlic, and cook, stirring, for another minute. Add the vegetable broth, herbs, nutritional yeast, sherry, and soy sauce. In a bowl, whisk or blend (with a hand blender) the soymilk and flour together until smooth. Add it to the saucepan and stir well. Simmer, stirring occasionally, for 15 minutes. Season with salt and pepper to taste and serve. You can find all of my Thanksgiving recipes right here. Enjoy! The gravy was fantastic!!! Another hit on my vegan menu!! i’d like to make this gravy for my christmas meal to go with your meatless loaf. you just leave the mushroom pieces chunky in the gravy? i suppose i could blend it if i want a smooth gravy? i made a chickpea gravy for thanksgiving. I like slices of mushroom in my gravy, but you could blend it or chop them small if you prefer to. thank u so much for the reply 🙂 i see how they reduced down after simmering, and it’s very yummy. made the gravy early today, i’m sure my parents are going to love it! Why does this always get me……. do you cook one cup of rice and use that cooked amount or do you cook rice and then use one cup of the cooked rice…….. In this case, you measure one cup of wild rice and then cook it. The difference is in the wording. “One cup rice, cooked” means measure a cup and then cook it. “One cup cooked rice” means cook it and then measure out a cup. Could the mushrooms be blended in with the gravy (e.g., with hand blender after cooking) without diminishing the recipe? One of my family members doesn’t like mushroom texture, but I think he would like the flavor of this recipe! I think that would work fine. Hope your family member likes it! Thanks for your response! I see now you already answered a similar question. Can’t wait to try this one! Is there a casserole version of this? Or something like it that I can take to Thanksgiving dinner? It looks sooo yummy, but I want something that people can take as much or as little as they want. Susan– my spouse has an intolerance to lentils. 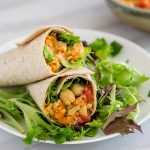 Do you think there’s a way to make these with split peas or a different bean? You can make it with any cooked legume. I hope you both enjoy it! 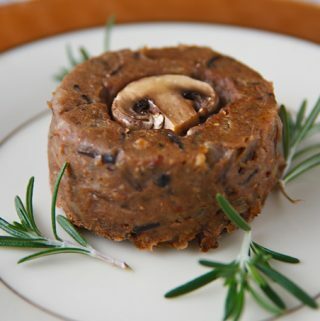 I made the mushroom, lentil and wild rice timbales today for Thanksgiving, as well as your vegan mushroom gravy. Both of them were so delicious and well worth the effort. I plan on making these every year from now on for Thanksgiving, as well as many times in between as well! This was an excellent choice for our Thanksgiving Dinner! I was out of white beans and substituted Adzuki beans. Used quick oats…but would use more next time for a firmer texture. Used Bragg’s Liquid Amino instead of soy sauce which all worked well. I also used Poultry Seasoning instead of sage , which I was out of. My husband rates it “very good”..and that from a non Vegan. I rate it excellent! Oops! I don’t know how to delete a review. The one above is for the Thanksgiving Loaf. Not for the Timbales. I did prepare the grave recipe and it was super awesome! I love gravy, and this one was delicious without all the fat. I used a few more mushrooms. My non Vegan husband loved the meal. This gravy could almost stand alone as a soup. i wonder if this could be baked in a casserole dish instead of individual ramekins? looks yummy. Just wanted to say a big thank you Susan for such an amazing recipe. I’m currently following the 5:2 intermittent fasting diet and use your blog for inspiration for both my fasting and non-fasting days. 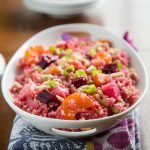 My husband loved this recipe too and it will definitely be a keeper for us. I’m only sorry it’s taken me so long to make it. This was the best gravy ever! Thank you! What dairy substitute would you suggest since I can’t use soy? I just want to say that my wife and I have been making these vegan timbales for Thanksgiving for the last 5 years, and they are absolutely wonderful. You gravy is amazing too. Thank you! I think I made these for Thanksgiving a few years ago. I honestly don’t remember it including lentils, but as they say, whatever! My question for you is this: Instead of baking them in ramekins, I have the metal timbale rings (no bottom). Should I still bake them in water, or will the water saturate the timbales? Thank you!!! I think if the bottoms are open, you can’t place them in water. I haven’t worked with those rings before so I’m not sure what to suggest to make sure they don’t dry out. Mmm, I’ve been thinking about these lately! I made them a few years back as a Christmas appetizer, set out on the coffee table with crackers and slices of crusty bread. I served it room temperature and plain, no gravy. My meat-pate loving grandmother loved it! These have been on my mind, so I’m going to make them just because! And this time I will try it hot and with the gravy, next to some green beans I need to cook!